The idea is to read more in 2011 than you did in 2011. Re-reads are okay! There are other guidelines/rules and different levels of "more" so check out the sign-up page and join us. I'm aiming for 116 or more books for 2011, unless I can find my 2010 records. 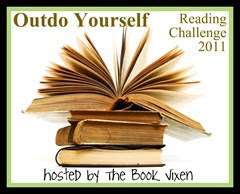 All books will be listed through my 100+ challenge post since the challenges duplicate each other. Off to look for my paper record of books read in 2010!